Egg dosa recipe is easy to follow and you can quickly make delicious egg dosa (a popular and healthy, protein rich and slightly calorie rich South Indian style variety dosa or South Indian style thin savory pancakes stuffed with eggs) for breakfast or evening snack or even dinner if you have dosa batter at home. Egg dosa is a popular in Kerala food too, which is more popular as a street food, usually served hot with chutney or sambar for side. 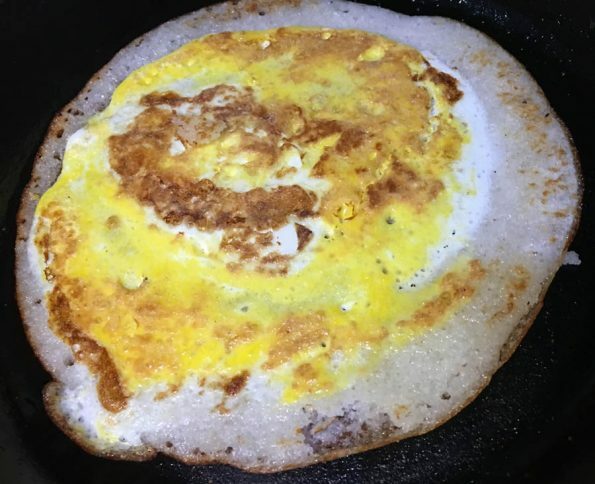 They are mostly prepared with added onions and sometimes veggies, but this is a simple version of homemade egg dosa without any veggies which you can easily prepare within few minutes of time. You can use regular homemade dosa batter to make this simple egg dosa at home or you can use this instant dosa mix to prepare the dosa batter at home easily. 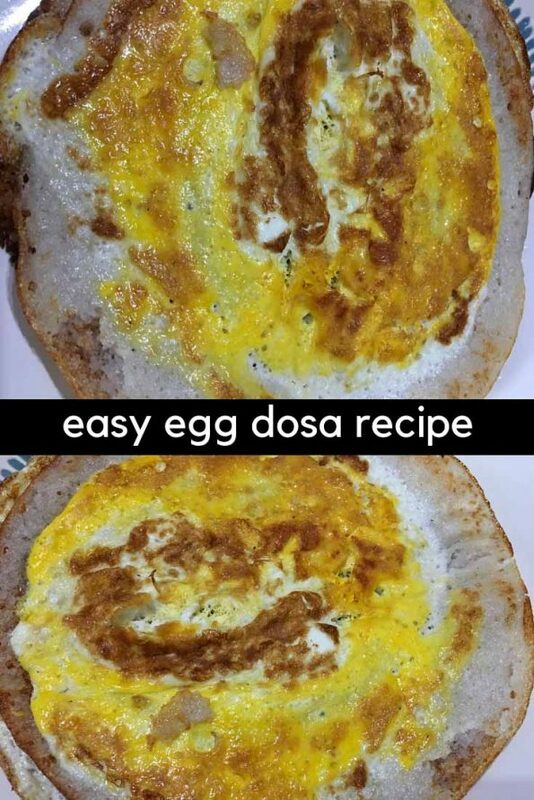 You can also use store bought dosa batter (usually available from Indian grocery stores) to make regular plain dosa, easy and delicious cheese dosa or this easy and delicious egg dosa. If you only have idli batter which is slightly thicker than the dosa batter, you can add a little water and mix well to make the right consistency for making dosa. See my blog post here to learn how to make idli batter and dosa batter at home for making homemade dosa and idli. 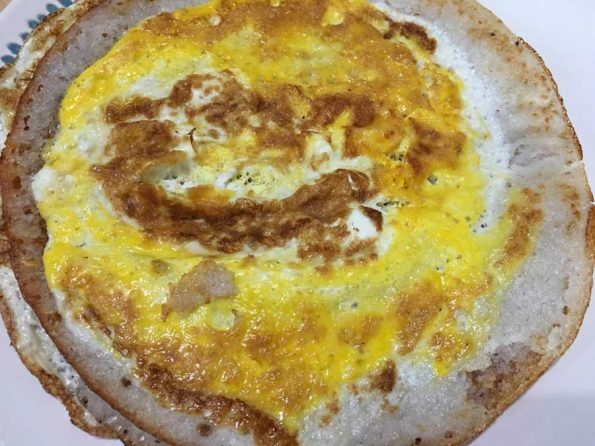 This is an easy egg dosa recipe without any vegetables, and it is a delicious egg dosa recipe which is kid friendly too. 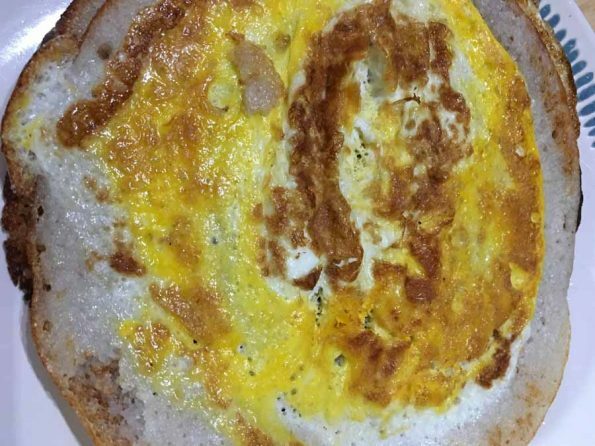 Here is how you can prepare this simple and delicious egg dosa following this easy egg dosa recipe at home. Easy, simple and delicious South Indian style variety egg dosa (savory Indian style pancakes stuffed with eggs). 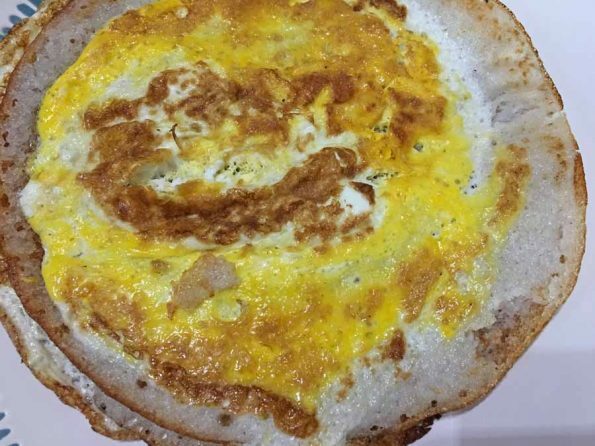 This is a simple recipe for plain egg dosa without vegetables, which you can make quickly for breakfast and it is a kid friendly recipe too. Heat an iron pan or non stick pan and grease with little oil or ghee. When the pan is hot enough, add the batter to the pan and using a ladle spread the batter in circular shape by making circles with the ladle. Wait for a few minutes so the batter will start to set. Once the batter starts to set in (in a few seconds), crack the egg and add it to the center of the batter. 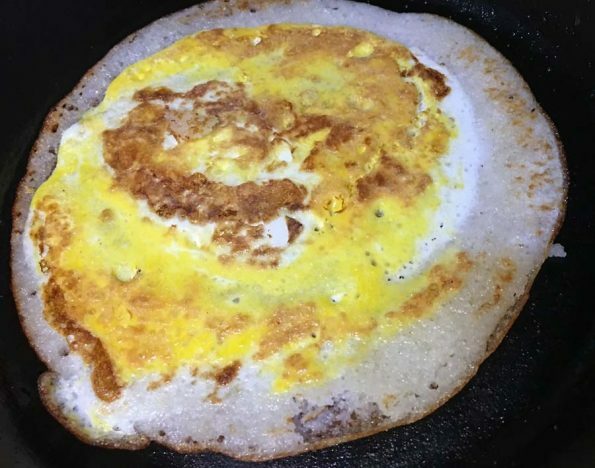 Using a small fork or spoon, gently mix the egg (without touching the batter as its getting cooked), and spread the egg mixture almost evenly across the dosa batter. It may slightly spread over the edges of the dosa batter over to the pan which is totally fine. Sprinkle little salt evenly over the egg mixture (according to your preference but eggs need only very little salt) and also add some black pepper powder if you wish. Wait for the egg mixture to set in and almost half cooked, which will take one to two minutes of time, so keep the heat in low at this time. As the egg is getting cooked, add the ghee or oil evenly on the dosa and the edges of the batter which will make it more flavorful and crispy and also helps to cook more easily. 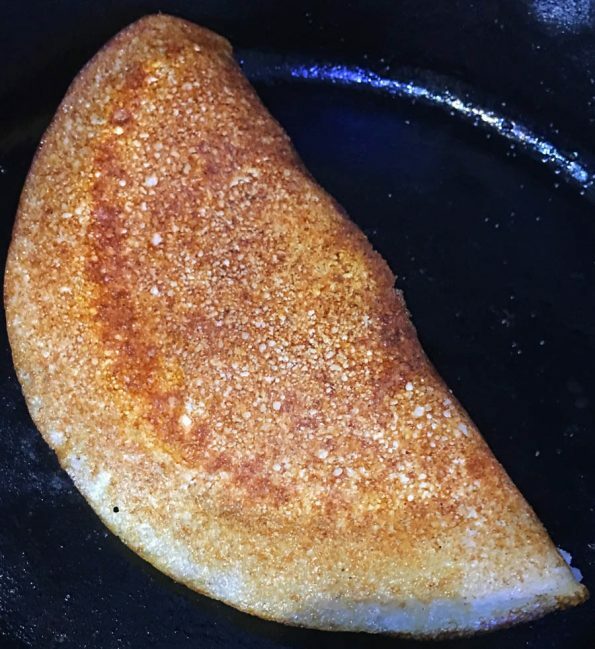 Once the egg mixture is about half cooked, gently flip the dosa (start separating from the sides first, then moving towards the center), and cook the other side of the egg dosa for another 1 minute or until the egg is fully cooked. Serve the delicious hot egg dosa with any chutney or sambar as you like! 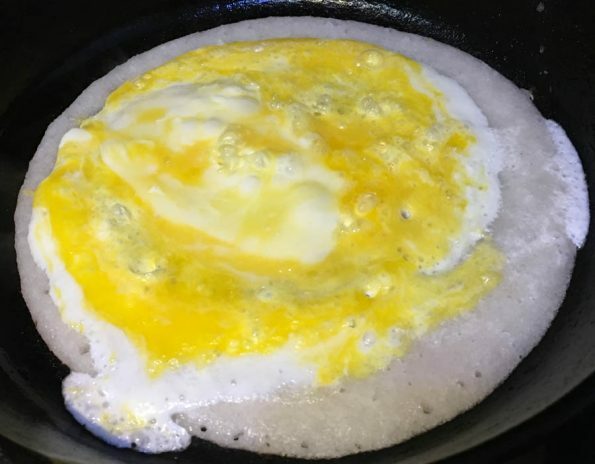 As you can see from the below picture, the egg mixture is poured over the dosa in the pan and wait until its almost cooked and set. The dosa is then flipped so the other side with the egg mixture is cooked very well. 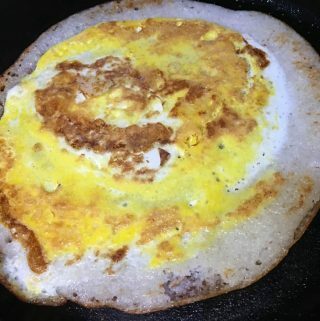 You can flip the dosa again, and as you can see the inside of the egg mixture is lightly browned and well cooked. You can fold dosa in half if you like to serve it that way! The delicious and easy egg dosa is simple and quick to prepare and you can serve it any of your favorite side dishes for dosa including chutneys like coconut chutney, tomato chutney, onion chutney, peanut chutney etc or with sambar. 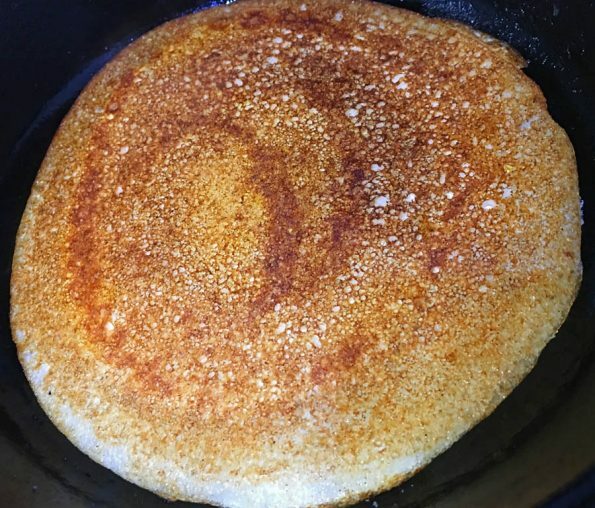 Hope you found this post on simple South Indian style egg dosa recipe helpful in making easy and delicious egg dosa for breakfast, snack or dinner!